Get ready for action in this streamlined, polyester football jersey. Our BOYS’ BLITZ JERSEY is made from 100% polyester diamond mesh to keep you comfortable on and off the field. 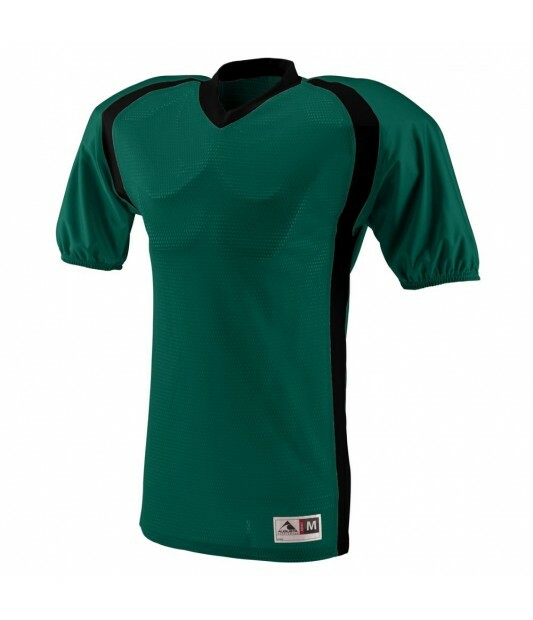 Lightweight and durable, this polyester football jersey is perfect for play or practice. The reinforced yoke, armholes and side seams, and double-needle hemmed bottom add extra durability to ensure this football jersey will stand up to the toughest plays. Oversized shoulders and full-cut sleeves comfortably accommodate pads. Contrast color shoulder and side inserts add style to this two color football jersey. Customize our BOYS’ BLITZ JERSEY to represent your team! Choose from 18 color combinations. Also available in Men’s sizes.